The New Mexico Angus Association (NMAA) and the New Mexico Hereford Association (NMHA) will hold its annual consignment sale of registered Bulls, Heifers and Cows at the Roswell Livestock Auction in Roswell, New Mexico on March 3, 2018. Listed below are the guidelines adopted by the NMAA/NMHA sale committee. The NMAA/NMHA sale will include registered bulls, cows, open and bred heifers and pairs, as well as commercial heifers. Only bulls calved between January 1, 2015 and April 30, 2017 will be accepted as consignments of the sale. Since this is a production sale of members, all bulls consigned to this sale must have been the property of the consignors at the time of birth or bought as a calf with a cow (as a pair) from a NMAA/NMHA member and have papers transferred within 90 days. Only registered bulls will be accepted. Females consigned to this sale must be less than 6 years of age by the first Saturday in March of the year of the sale. All bred females must be bred by a registered bull of same breed and must be pregnancy checked by a licensed vet or other certified qualified person. Information about the pregnancy check should be brought to the sale along with the breeding status. A registered female entry may be bred to a maximum of 2 bulls if she is artificial inseminated (the A. I. bull and one clean-up bull only). If a natural sire is used with a female, the female entry is allowed only one sire. All females must have been brucellosis vaccinated before 12 months of age prior to arriving at the sale. The producer must have proof of brucellosis vaccination by veterinary papers and/or the brucellosis metal tag in ear. Commercial heifers are welcome and will be sold at the end of the sale. Each consignor must be a member of the NMAA or NMHA with annual dues paid to date. 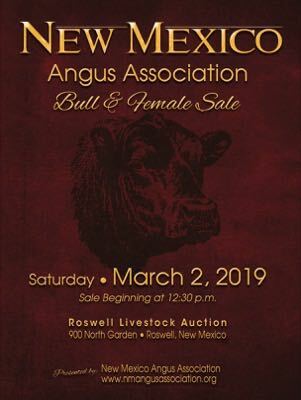 Angus producers must have been a NMAA member one full year prior to the sale and have attended at least one meeting in the year prior to the sale to be eligible for the sale. If your dues have not been paid, please include them with your entry fees with a separate check. A registered animal entry will be considered "OFFICIAL" upon receipt of a photocopy of each animal’s registration certificate. Original registration certificates or handwritten copies are not acceptable. No animal will be considered "OFFICIALLY" entered into the sale until entry fee is paid and a copy of the registration certificate is received. Entries will be processed generally in the order in which they are received, with consideration given for layout of the catalog and advertisements, therefore it is to your advantage to get your entries in early. The number of bull entries per individual will be determined by the sale committee each year. There will be a limit of 100 Angus bulls in the sale. Females are not limited. It will be the responsibility of the consignor to transfer the registration papers of their animals to the new owners within 60 days of the sale. FAILURE TO TRANSFER PAPERS TIMELY MAY RESULT IN NOT BEING ALLOWED TO CONSIGN ANIMALS IN THE FUTURE!!! As entries are received they will be cataloged generally in the order of receipt, depending on spacing in the catalog, and each consignor will be sent an ear tag corresponding to a lot number, for each lot entered. It is the consignor’s responsibility to see that these special ear tags are placed in the left or right ear of each animal, prior to coming to the sale. Ear tags other than these designated will not be accepted. Tattoos may be checked at time of arrival. 6. Roswell Livestock Auction will be responsible for clean up. All registered Angus entries must be genomic tested, which includes HD50K, i50K, GGPHD, or GGPLD. If the testing is not complete when the entry form is mailed by the December 15 deadline, the animal will not be allowed in the sale. All bulls will pass a Standard Breeding exam and "Trich" test administered by a licensed Vet. TB test and Brucellosis test for bulls and females will be required if necessary for your county or to move across state lines. Please check with your local brand inspectors for requirements for your county. Papers from all tests are to be brought to the sale. Pi BVD testing is recommended, but not required at this time. Registered Angus animals must be clear of all "Genetic Concerns" (AM/NH/CA/M1/DD/D2/OH/OS) when entered by the December 15th mailing deadline. Each consignor should carefully select his or her entry with the following criteria: structural soundness, breed character, weight for age, conformation and body condition, and EPDs. The weight and condition of the bulls will be dependent on both genetics and environmental factors. Bulls thin in condition usually sell at a lower price than genetically comparable bulls in better condition. Therefore, it would be advantageous to have your bulls in better condition at the time of the sale. Take time to treat your animals for grubs and any other external blemishes, which gives your animals an unsightly appearance. Some minimum weight requirements that were adopted by the sale committee are as follows on the attached sheet. Bulls may be weighed upon arrival at the sale at the discretion of the sale committee. Bulls not meeting the minimum weight requirements as indicated on the attached list will not be allowed to sell and will be removed from the display area. Marketing of these bulls to buyers coming to the sale will be prohibited. Please weigh your bulls ahead of time before hauling them to Roswell if you are not sure they will meet weight requirements. Any bulls not meeting these requirements will not be allowed to sell. The New Mexico Angus Association and New Mexico Hereford Association reserve the right to disqualify an entry due to a rule(s) infringement (Rules listed 1-14). Any disqualified animal must be removed from the sale yard within 2 hours of notice. Failure to comply could result in disqualification of remaining entries. The sale order for this joint sale will be Angus bulls in the order they were graded regardless of age, followed by Hereford bulls in the order they were graded regardless of age, then Angus females, Hereford females, and commercial females. Female sale order is bred heifers, open heifers, pairs, cows, and commercial heifers. Phenotype will be considered in the selection process. The committee will evaluate each bull individually for soundness of feet and legs. Bulls should have a desirable angle to the pastern and hoof. Bulls should toe ahead straight. Body condition of the bull is evaluated for weight compared to age. The weight and condition of the bulls will be dependent on both genetics and environmental factors, but heavier bulls compared to thin will be more desirable. Judges will use this to factor into the grades. CED, BW, WW, YW, SC, $EN, $W, and $B are the traits that special focus will be placed. Actual birth, weaning, and yearling weights may be used to influence grades for the bulls. Receiving deadline for animals consigned to the sale will be Thursday afternoon March 1, 2018 before 4pm to be weighed. Any animal arriving after the sifting committee has finished will sell at the end of the sale. There will be an ice-breaker on Friday night, time and place to be announced. We plan to advertise in the New Mexico Stockman, The Livestock Weekly in San Angelo, and the Clovis Livestock Market News. If you would like to add comments for your individual entries in the catalog, you will need to e-mail a digital copy with a brief TYPED description – limit of 50 words – to describe the animal or other pertinent information about your entry that might help it sell. Type the registration number of the animal you are describing at the top of the page in case the sheets get mixed up. Submit e-mail entries to Radale Tiner at rtiner@angus.org. Ads and descriptions are due Dec. 15, 2017. If you would like to include a picture of an individual animal or reference sire, please indicate so on your entry form and e-mail a picture in JPEG format to Radale Tiner at rtiner@angus.org by Dec. 15, 2017 along with the registration number to associate the picture to. There will be an additional cost of $20.00 per picture inserted into the catalog. Photos may be limited when catalog layout is determined. Substitutions are strongly discouraged, as we want the catalog to represent accurately the cattle that will be at the auction, however there may be instances where an animal does not pass a test or meet weight guidelines or other uncontrollable issues. In these instances ONE substitution will be allowed. No matter the number of bulls entered by one consignor, only one bull can be substituted total. It will be up to the consignor to provide flyers with correct pedigree information to potential buyers, as the catalog will already be printed. There will not be a floor price set by the NMAA/NMHA for any of the animals going through the sale ring. It is the responsibility of the individual consigners to "protect" or make sure their animals meet their minimum sales price, if any. If a consignor bids on his/her own cattle, he/she will be suspended from the sale for 2 years. Sale expenses will be based on the price sold for in the ring.